This month, we took a juxtaposed approach to Ladies at Lunch for the Health and Happiness Issue, with a night-time candy-making display in Noosa. As I grow older, my pursuit of good health and happiness holds more importance, and I have become a better person in the process. I have learnt to do away with the silly fad diets and eat more real food, I set an alarm for going to bed and waking up, to ensure I have enough sleep and time to walk my fur babies in the morning. I have replaced my daily coffee with a healthier alternative – but I still allow myself a treat or two of my favourite brew on weekends. Balance is key when pursuing a healthy lifestyle, so with that in mind, the ladies and I let our hair down and treated ourselves to a candy-making demonstration (and tasting!) at Candy Addictions in Noosa. Joining me was Danni Morrison from Design by Danni, Amy Ratcliffe from McGrath Realty in Caloundra, Sian Howard from Sian Howard Makeup, Aimee Russell from Aimee Provence, Rebekah Fusca from Mask Events, and Sarah Roseworne from Heidi’s Body and Skincare. Profile: What is your current approach to health when it comes to you and your family? Danni: Lots of preparation and routine. My fiance and I have his three children week on week off, so I plan accordingly to make sure everyone eats healthy, nutritious meals that they actually enjoy. If that means hiding 1kg of veggies in bolognese sauce, then so be it! Sian: Health is very important to my partner and I. We live an active lifestyle, set ourselves goals and eat clean with treats in moderation. It really is all about finding the right balance to suit you. Sarah: Everything in moderation. This allows us to enjoy all aspects to our life whether it be socialising, work or fitness. Rebekah: Our family approach to health is also about balance. 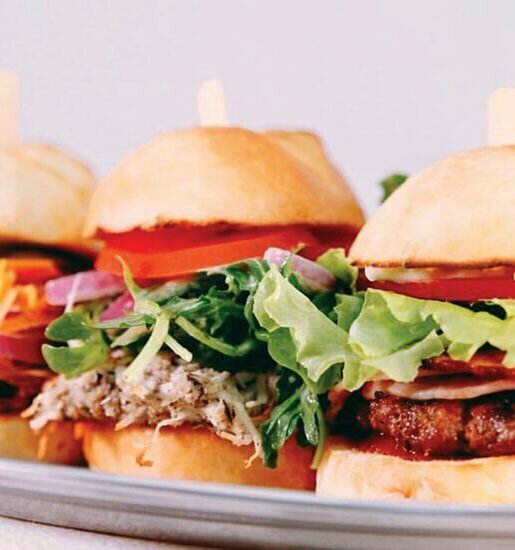 We try not to restrict any food. Our daughters know that if they are going to ask to eat one of their leftover Easter eggs, then I’m going to ask them how much salad and vegetables they have eaten today. The same goes for exercise. They know that they must balance their iPad time with getting outside and shooting some hoops or taking the dog for a run on the beach. Amy: My current approach to health includes mind, body and spirit. I nourish myself with fresh air, sand between my toes, fresh food and time by myself to switch off and unwind. Aimee: We have a busy lifestyle, I work seven days a week and don’t really find the time for fitness, although I do try and meditate – I think it’s important for our health to have some down time. It’s so easy to get caught up in the rat race that you can forget what’s most important in life; the ones you love and your health, that’s why it’s so important to look after yourself and your family and find that special time to enjoy what life is really about. 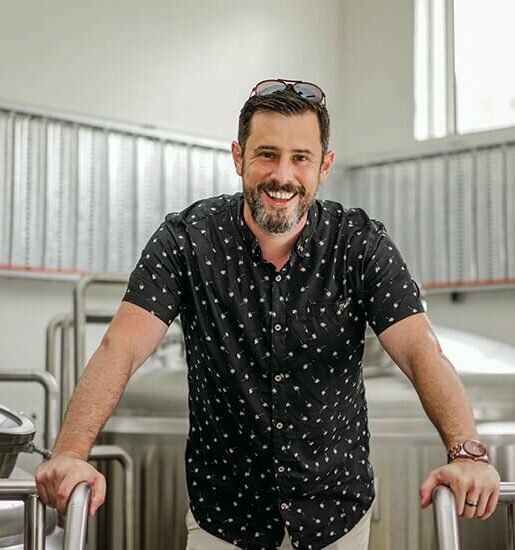 Profile: How do you find balance between health and happiness? Rebekah: Health = happiness for me. I had some health issues a few years ago which has resulted in gluten and dairy being eliminated from my diet. When people ask me something like, ‘Don’t you miss cheese?’ I respond with, ‘Sure, but I’m happier knowing that I can now get out of bed each day and have the energy to do all the things I love’. My healthy lifestyle is now what brings happiness into my life. Aimee: I think it’s really important to have a balance, we try to be healthy most of the time but we do love the odd indulgence, which can’t be helped really when we own a high tea parlour! My five-year-old loves my scones. Amy: I don’t beat myself up if the balance is a little off. Sometimes the scales are tipped one way and sometimes the other, but I just try and get the balance as close to perfect as possible. Sian: I think health and happiness are intrinsically linked rather than mutually exclusive. You have to find what works for you and banish those feelings of guilt that sometimes creep in when we’ve over indulged or skipped a workout. Danni: I agree; for me, health is happiness. When I’m exercising and eating well I always feel more positive, productive and full of energy. Weekends I treat differently simply because they’re weekends! Sarah: I find that taking care of my health creates happiness, but again I feel like it comes down to moderation. Profile: What is your guilty pleasure/vice? Aimee: Definitely my homemade scones with blackberry jam and clotted cream; my nan’s sherry trifle, which is seriously delicious and she only makes it at Christmas; and a good bottle of wine. Sian: Pana chocolate in any flavour or a Nutella donut from the Marcoola markets. Amy: My favourite thing in the world to do is to go and see a movie by myself and not have to share my popcorn! Danni: Wine, closely followed by chocolate and shoes. All three are my Achilles heel but I’m okay with it because they’re all wonderful in moderation. Except for shoes, all women should own bulk shoes! Rebekah: Watching TV on my iPad, curled up under the doona, in my huge bed. It’s what I do to balance out the hecticness of my life. It’s my quiet down time to just turn my brain off for an hour. Sarah: My guilty pleasure is sitting on the lounge with a glass of wine and my favourite chocolate watching trashy TV. Profile: What are some healthy fads that you have tried over the years? Danni: The Lemon Detox Diet. Did anyone try that one? Yep, let’s lose 3kgs in a week by drinking copious amounts of warm salty water and a cayenne pepper-flavoured mixture, which you then in turn gain 5kgs the following week! I stay well clear of these sorts of fads now, consistency is key for me. Aimee: I have detoxed in the past, I haven’t done it yet this year, but I’m going to try and get round to it at some point. I found it worked really well, I would have warm lemon water in the morning, fresh juices throughout the day and veggies or salad for dinner with no meat. I did that for about three weeks and I felt great, I had so much energy. 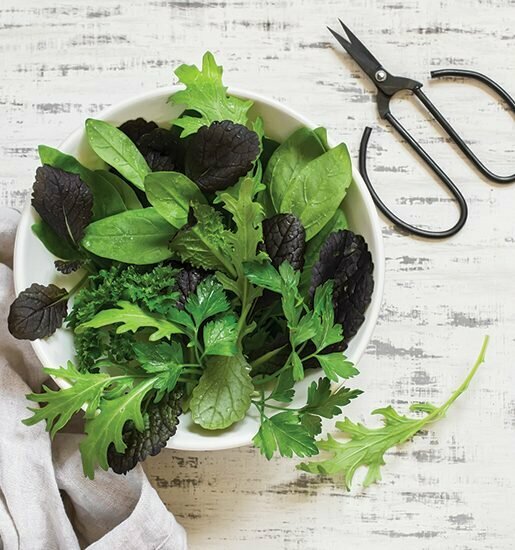 Sian: I’ve tried a couple of different approaches to diet – paleo, vegan, raw – and have come to the conclusion that ‘flexitarian’ works best for me. Sarah: Healthy fads that I have tried are quick fix diets that don’t change your way of looking at food but give you the easy option, that make you drop the weight quickly but once you stop the diet it normally all comes back on. 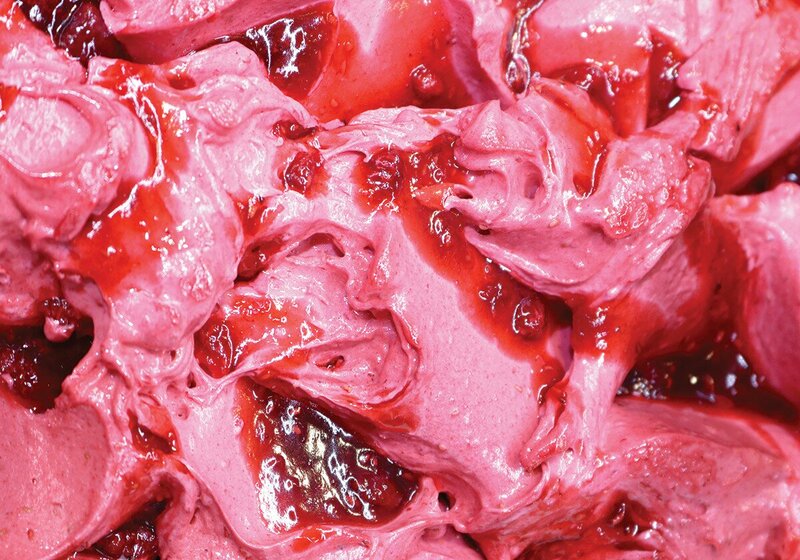 Rebekah: I, unfortunately, grew up with a very unhealthy relationship to food. Denying myself food to lose weight is something I’ve felt I needed to from the age of 13. The only fad that I have found to bring my body to its optimum level of health and stabilise my yo-yoing weight, is to eat a wholefood diet. Moving to Noosa and having access to the fabulous Farmers Market, is a godsend. We barely have to buy anything from a traditional supermarket now. 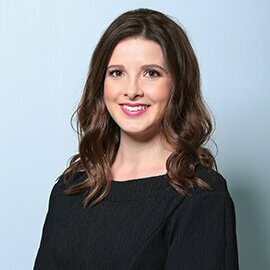 Profile: What is your go-to piece of healthy advice? Aimee: I grew up in a small town in Hertfordshire in England, my mother always cooked wholesome homemade cooked food from scratch like chicken vegetable soup, stews and roast dinners, which are full of goodness. And we always sat down together as a family at dinnertime. I guess I have learnt a lot from her when it comes to cooking. Shepherd’s pie is a good one for hiding veggies in for the kids – you can just grate up carrots, celery, swede, any vegetable really, and just mix it all up with the mince. Sarah: My advice is to start the day with a warm glass of water with lemon. It helps with the digestive system and rehydrates the body, then throughout the day drinking at least 3L of water. Amy: I agree, drink as much water as you can, take your make-up off at night and treat yourself to ‘You time’ as often as possible. Danni: Mine is about being prepared and consistent. If my meals are planned and ready to go, I’m less likely to grab quick and easy takeaway when I’m out and about. I say this because it’s exactly what I do if I’m not prepared! Sian: It might sound knaff but you really need to listen to your body – know when to push and when to rest. And same with Danni, I think it’s really important to plan and prepare meals in advance so you don’t make bad choices just because you’re hungry and tired. I also hide fruit in a breakfast smoothie for my partner every morning, but don’t tell him! Rebekah: I agree – work out what is best for your body. Both for food and exercise. When you put food into your body, pay attention to how you feel, not just physically, but mentally. When you exercise, do you enjoy it? I can tell you that I love to add hemp seeds to my smoothies and I think that refined sugar is like a drug, or that yoga is a saving grace in my life and that smashing myself in a gym session no longer works for me, but that is just me. You need to listen to your intuition and do what makes you feel most alive, not give attention to what is the hottest new trend this month. 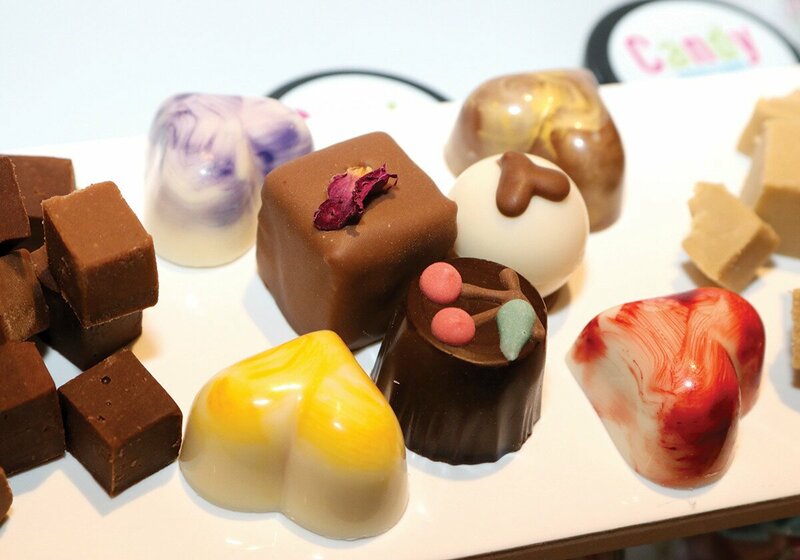 I truly was like a kid in a candy shop – marvelling at the colourful array of sweets, chocolates, fudges and gelato, Candy Addictions is the sweet spot in Noosa. 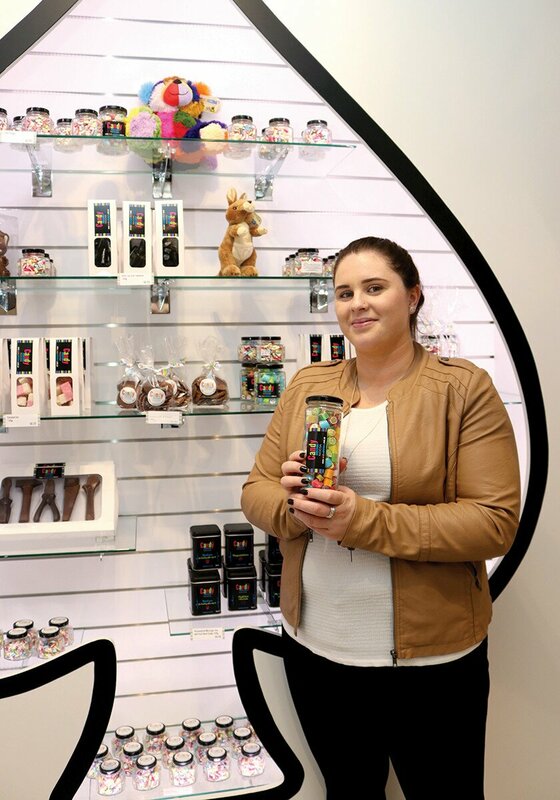 Having been in Montville for 20 years, Candy Addictions has long been a favourite for locals and visitors to the Hinterland destination, I can personally attest to picking up a few packets of rock candy and rosy apple lollipops whenever in town. 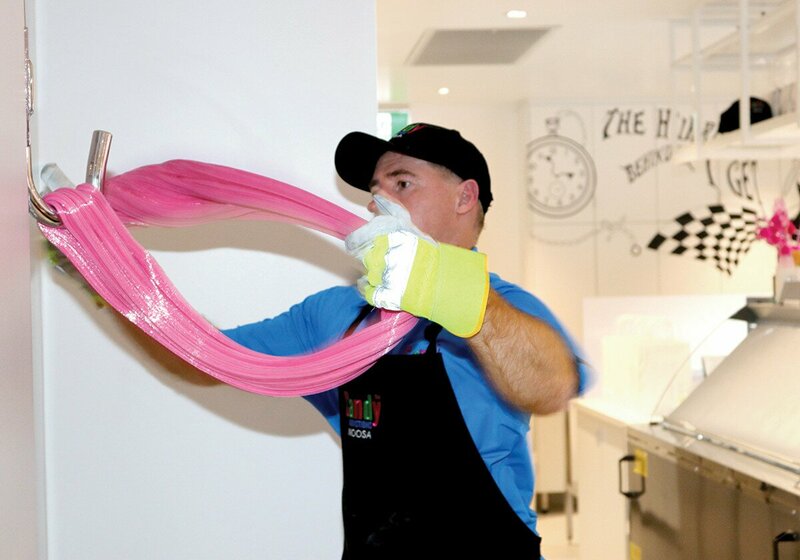 With the dream of being able to extend their super sweet abilities and offerings, Candy Addictions relocated to Noosa’s Hastings Street in May, where they can now make more than just candy on-site – whipping up super smooth gelato, creamy fudge and chocolates, which are all available in store. 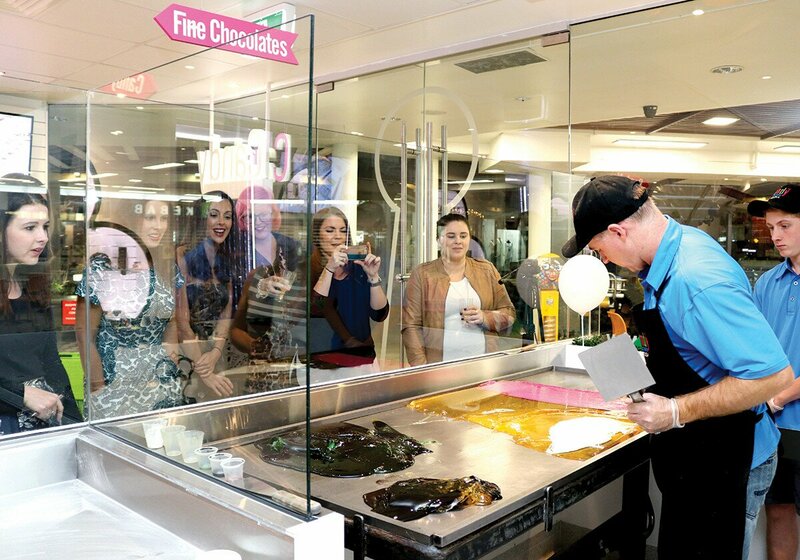 Did you know that there are only six people in Australia who make the hard candy, which made our demonstration even more special on the day of our visit. Scott Williamson took us through how to make their watermelon rock candy, which starts at a blistering 140ºC! Working on a cooling table which has water running underneath the surface to cool the candy, they add the flavouring, colouring and citric acid to counterbalance the sweetness of the sugar syrup. Working each of the colours – pink, white, green and black, Scott manipulates the sugar until it comes together in a mass and reaches 70ºC. He then moves it over to a heated table, where he further works the sugar, flicking it over a hook to create a creamy or pearl-effect in the candy. Then the magic begins – creating tiny candies from a 12 to 13kg mass! Firstly Scott needs to create 16 black seeds from the one piece, which he does by working his way from one to two, four, eight and then 16. He then ‘builds’ the watermelon picture, wrapping the seeds in pink, then white and finally the striped green outer, or skin of the watermelon. Once he has assembled it, he rolls it out to thin lengths, about 1cm wide, which continue to be rolled so they don’t lose their shape. 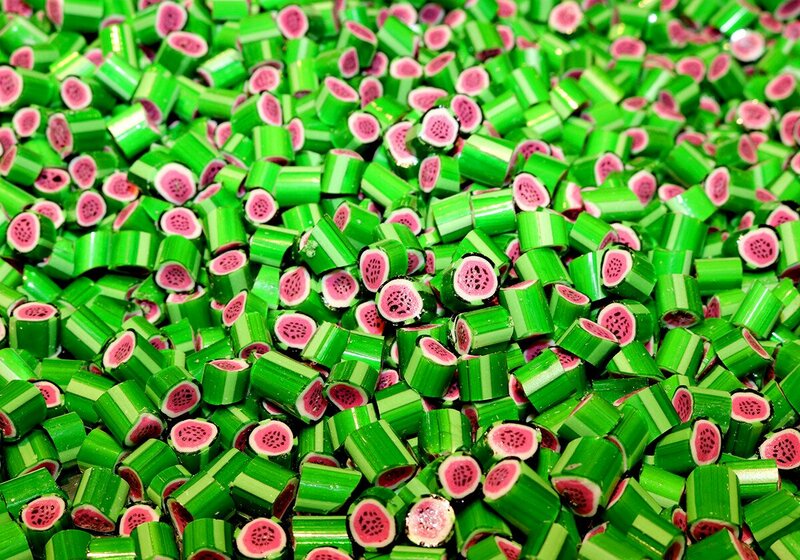 When the candy sets, Scott then cuts it into 3500-4000 pieces! 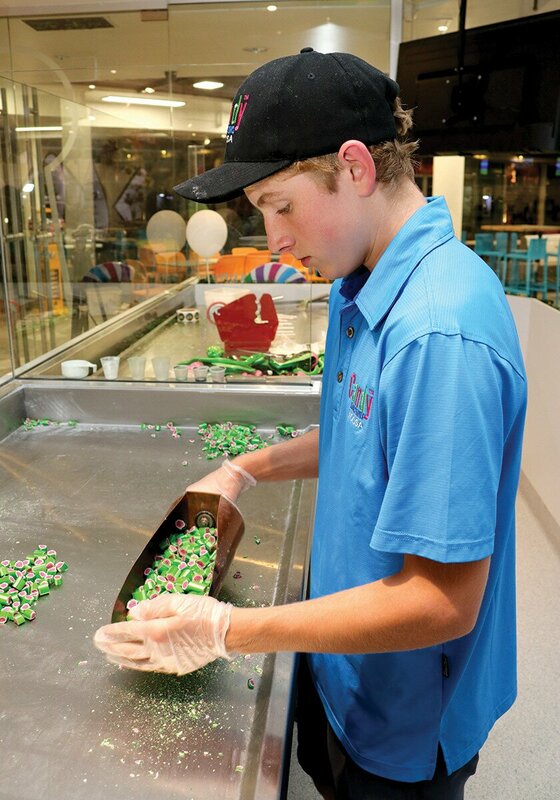 It was hypnotic watching Scott chip away at hundreds and thousands of pieces, and then it was time for us to try and it was surprisingly easier than I expected – needing very little force, as the candy is so brittle. While the candy-making process is absolutely amazing, what I also found incredible was the tools they use to make it, given it’s such a niche industry and skillset. To cut the candy, when it’s in its softer state, they use dress-maker scissors, when handling the candy, they use simple gardening gloves, and to cut the candy in the final stage, they use a stainless steel paint scraper. Talk about being resourceful! As well as trying our hand at cutting the candy, we also made our own twisted lollipops, which was a lot of fun – if I ever change careers, you’ll know where to find me. Along with being treated to the candy-making display, we also tasted their selection of gelato. The Ferrero Rocher was my absolute favourite and was the best gelato in this flavour I’ve ever tasted; while it was rich, velvety smooth and loaded with flavour, all of the things you want in a good gelato, the taste of hazelnuts was really prominent, which balanced out the sweetness and had me wanting more. The mango sorbet also got a big thumbs up from the ladies, who said it tasted like eating a mango, if only it were as healthy! And then there’s the fudge, super smooth and creamy, the flavours are subtle and delicious. It’s a hard job sampling all of these delicious delights, but someone has to do it!